Site traffic statistics are now available! Site traffic statistics provide powerful insight into your website. You can check traffic trends to see if it's increasing, decreasing, or staying level. You can get an even deeper understanding of your visitors by analyzing the statistics. For example, if your number of visits is almost equal to the number of unique visitors, that means over the given time period, most of them haven't come back to your website. On the flip side, if the number of unique visitors are very low compared to the visits, it means you're getting more repeat visitors. We're excited to bring you this convenient and easy way to check your website statistics, all within My Yola. This is such an awesome feature!!! Thanks, Nathan! We are very excited as well! im on silver yola site. and 6 mouths later still havnt had any taffic a big y ???? I am loving all the new features rolling out of the Yola factory of late. Keep up the excellent work guys. I have a small problem though. Not sure if it is related to the new release. My "make a free website with Yola" footer is back. I'm not sure how long its been back, but I didn't notice it last night. Thanks Brianna, but it still seems to be there? I'll check back tomorrow. It's late here... thanks again. Did you try publishing your site? If you are still seeing your footer, there is a possibility that you need to clear your cache. All working hundreds now Brianna. Thank you very much. Brianna is offline but I'll let her know you're all sorted Boomer, thanks for reporting back! Hey that's good to hear, thanks for the report Callum! Hi Liz! If you are in My Yola and look on the left hand side, you should see Site Traffic in the menu (between My Yola and Domains). Let me know if this helps. Got it!! Thanks. I'd logged in too far before. I am so happy now- I like getting help that i can understand. and I mustnt be using ie9 as I can see my traffic. Now all i need to do is to get more people to look at the site and watch the graph go up!! Hi, what browser are you using? By the way, IE stands for Internet Explorer. I'm so glad to hear that you're able to see your site traffic now! If you wish to drive more traffic to your site, you may be interested in seeing this tutorial: Getting more traffic to your site. why does it say "Unique Visitor Change" and give a %, when you description above at the top of this topic talk about quantities. and that "Visitors" is the total number of visitors but is that the number of different visitors or is it perhaps the same few people visiting over and over again. apart from that I love the feature and the overall site, really bl**dy usefull, so glad I found you. Hi, I don't think it tracks you when you are building your site, but, it does when you preview it and view it on the web. I am sure that someday they will set it up where you can make it not count your visits. Just wanted to clarify a couple of things. If someone visited your site two days ago and then visited it again yesterday, you'll see 2 visits logged, but that would only count as 1 "unique visitor." Hope that helps to clarify the terminology. Also, whenever you edit or preview your site, this is not included in the total number of visits. The only way for the total number of visits to increase is by actually visiting the URL. Unfortunately, at the moment, your visits will be counted. We're looking into if we can potentially remove your visits, but it would not necessarily be 100% accurate as we would not know if you used a different computer for example. "We're looking into if we can potentially remove your visits, but it would not necessarily be 100% accurate as we would not know if you used a different computer for example"
(Theres a Google Gadget that reads your external ip address as well). We use these methods when our customers want to connect to their CCTV system from out there, they need their networks external ip address which the CCTV system is connectrd to. I've setup a shell of a site, published it and visited it several times on another tab, still I see no visits using site traffic. Logged off my computer and logged back on and went straight to my site and then logged into My Yola area and still see no visits. Thanks! I'll check it again tomorrow. I did check it out last night since I created it last night, but still didn't see any visits. I'll check it tomorrow and see. No problem! :) I am pretty sure it takes 24 hours to put it in. Okay, cool! Maybe I'll see something tonight late sometime! I'm still tinkering around anyway, trying to find some useful items to add that enhance the theme (business) of my site. Hi Dale. See the screenshot posted by Brianna above. 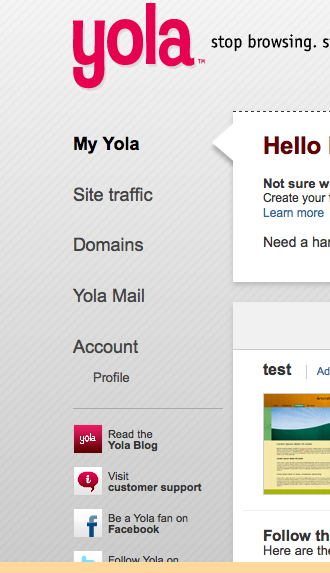 When you log into your account you will be take to the "My Yola" page. Directly below the "My Yola" link there is a link that says "Site Traffic". Click on this and you will see the stats for your site. The level of detail in your stats depends on your account status. If you are still unable to locate the feature, please let us know. Yes, it is good to know. 6 mouths on this site and had no vists y ? Do you mind sharing for which site you're not seeing traffic? I'd like to investigate this further. In the meantime, have you been able to check out our tutorials on how to Promote your site? You may find this to be helpful information. How can I view how many hits from day 1? We're so sorry to have missed your question. The Site Traffics statistics are updated on a 24 hours basis. If you are Yola Free, you can only view the last 7 days. If you are Yola Silver, you can view for the past 30 days. It is not possible to keep a running tally since day one. I'm sorry. This is one great feature for all the Yola users. 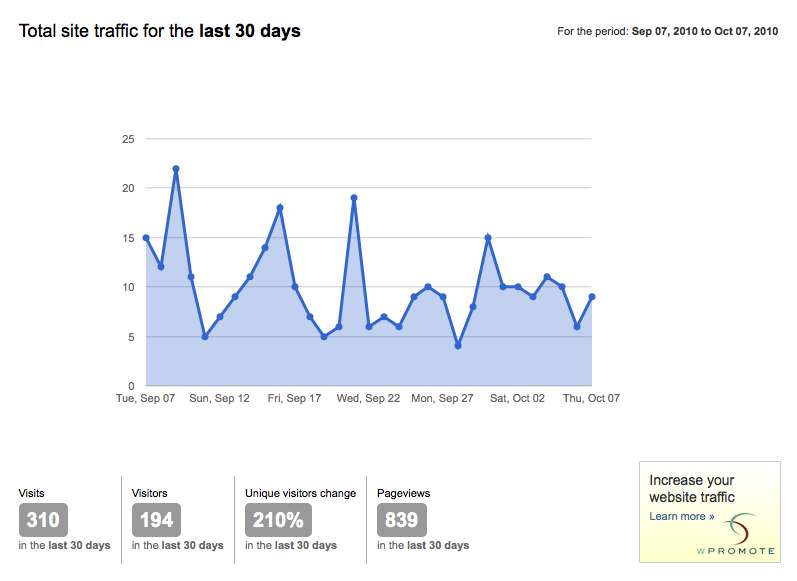 With the Site Traffic feature, we will be able to determine how many visitors our site is getting. That said, we will have an idea on how to optimize it on search engines. Does this count how many times I visit my site (even if I am logged in)? Is the number skewed because I want to see how it is looking? When you visit your site in the site builder, I'm pretty sure that it doesn't record those visits. However, when you view the published site (i.e. yoursite.yolasite.com) it will record those visits. Nathan is correct - it will only count your visits if you go directly to your published site. I hope that helps! Is it possible to see the amount of data thats used? I want to increase my SEO by hosting my site locally. I already have the domain name pointing to yola but that's not good enough. I want to know what data plan to take out and it would help a great deal if I knew how much data was being used at present. If this is not possible I will have to check my pages per visit and my site data per page to roughly calculate it. In order to get such detailed site traffic information, I encourage you to sign up for Google Analytics. I would like to inform you that we do not allow our customers to download Yola created websites for external hosting. That being said, you may not be able to continue forward with this idea. Please let us know if you have any further questions or clarifications. Thanks! I got a little question. I am going to publish my site in a few minutes, and I now read in this topic that you can see how many visitors your website has. 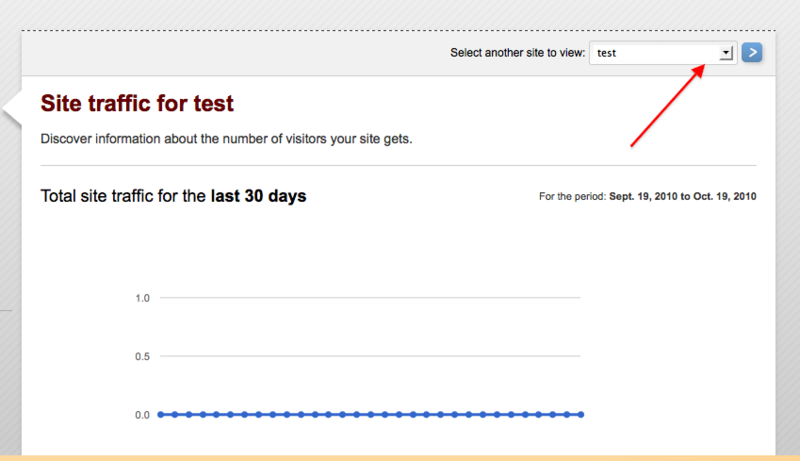 But there is standing : * Free and Bronze users can see the number of visits to their websites over the last 7 days. I am a free user so I can see the number of visits over the las 7 days, but can I also see How many visitors I got in total. So all my visits over the whole time I have my website and not just the last seven days. Dat is toch geen probleem dat u van Nederland bent, ik spreek ook een beetje Nederlands :-). Maar mijn Nederlands is zeker helemaal slechter dan uw Engels, dus ik probeer het maar. Ja, als een Free user kunt u de bezoekers alleen van de laatste 7 dagen zien, maar niet alle bezoekers in totaal. Met Yola Silver kunt u meer data van uw website traffic aankijken en ook Google Analytics gebruiken. Hi! What is the difference between "visits" "visitors" and "page views"???? Thanks! A specific "visitor" can return for multiple visits; the sum of all visits by all visitors is the "visits". Any visitor can look at a number of different pages. The sum of all the pages seen by all visitors is the number of "page views"
Are you planning to roll out more in depth traffic analysis? Not in the foreseeable future. There are great tools like Google Analytics which you can use for free on any Yola account type. Visits vs Visitors - Definition taken from Google Analytics.